OK, it is not the best Mexican food in Columbus, it’s just a list of my current favorite Mexican restaurants. For years I have dined at lot at Mexican restaurants in Columbus because of the corn tortillas. I am on a diet now so I am trying NOT to eat out at Mexican restaurants because of the corn tortillas, frijoles refritos and all that melted cheese. I love all that melted cheese. After 7 years of Mexican restaurant posts I think we probably eat Ohio Mexican in central Ohio, the “Tex” in “Tex – Mex” is Texas. The Mexican food in Columbus is Americanized. Welcome to America. Even to those who are in Columbus but have lived in southern California, Texas etc. Welcome to America. I am limiting my current favorite list of Mexican restaurants to three. I live and work in the Worthington – Polaris – Lewis Center sphere, so for me the closer to that area the more likely they will become my favorite. I am open to trying other Mexican restaurants. On the original Columbus Best Blog (this is ColumbusBestBlog.com, see the distinction?) someone named Joe recommended Cuco’s on Henderson and I have been there a couple of times. actually in 2006 Tony southern California to central Ohio transplant was telling the world the only Mexican restaurants in Columbus were Taco Bells. Links to his post now come up “Sorry, the page you were looking for in this blog does not exist. “ Tony left Columbus and moved to Nebraska, Iowa, Kansas… I forget. 2. Baja Fresh, 3 Northwest Columbus locations Gone! Gone! Gone! 1. La Hacienda Real, Northland area, 4855 Sinclair Rd Columbus, OH 43229 GONE but reborn. Other central Ohio Mexican restaurants… I really liked Blue Agave in the Polaris area but I have only been there once, in 2012. I really liked a place on Cleveland Avenue but have never been back. I loved Fiesta Jalisco on 161 but have not been back in years. There’s a new one? There’s also a new Chile Verde too. Although the Crosswoods El Acapulco made my list of favorite Columbus Mexican restaurants, I don’t particularly like the Polaris, El Acapulco restaurant. Same menu, same management. We had our office (the HER Realtors, Lewis Center office) Christmas party at Senor Antonios Mexicano Restaurante & Cantina. Senor Antonios is at 8617 Columbus Pike, Lewis Center, Ohio (right across 23 from our office which has a Powell mailing address.) I ate there once when it first opened years ago and have NOT been there since. Way back when I first tried it, I thought Senor Antonios was good but high priced for Mexican food. What we ate at the office party in 2012 was wonderful. There was lots of melted cheese involved. I’d imagine Cantina Laredo is expensive. I have NEVER eaten at Cantina Laredo. Cantina Laredo is at 8791 Lyra Drive, Columbus, Ohio in the Polaris Fashion Place, a high rent district? I hate Tequila’s Mexican Restaurant at 1047 Polaris Parkway, Columbus, Ohio 43240 but that may be more about their Groupon than their food. My one and only experience there was very, very disappointing. Not so much the food as the service and an extra $5 charge they said had to be paid to use the Groupon. NEVER again. Perhaps hate is the wrong word. 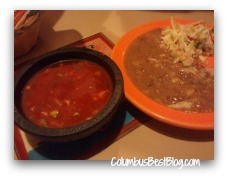 What is the BEST OH – Mex in your part of central Ohio?